Als Korrektur- und Optimierungswerkzeug formt das Vitalizer MK2-T Plug-In den Klang musikalisch und effektiv. Dabei erzielt es in den bearbeiteten Spuren und Kanälen mehr Lautheit und größere Stereobreite sowie harmonische Tiefe und Wärme. I have so many software exciters - PSP ones including the VintageWarmer, WaveArts, and probably additional ones I just forgot for now. None is making this exciting job as good as the SPL Vitalizer. After review of several harmonic enhancers I have selected the Vitalizer because I've been blown away by the demo on the shapping capabilities on the low-end. It's not only nice to create some sparkle and stereo widening on the mid and highs if required. It also shapes your low-end (bassdrum, bassline) dramatically and gives it the sound you hear on so many modern records. Until now I used often the SPL transient designer and precision enhancer to shape the low-end. But it's only with the Vitalizer that I get where I wanted to be. If you are looking for a knock-out punch in your sound setup, add the SPL Vitalizer, in conjunction with Precision Multi-Band, you can literally make your high frequency on your EQ, sound like "Angels in Heaven" and still have a mighty "Super Funky",Bass line. You can also use this combination on Drums, clear cymbals and "Heart Beat", bass drum. You can't go wrong with the SPL and Multi-Band. The SPL Vitalizer is a really subtle plugin. It will help you to achieve a Little more width, a little more punch on the low, more clarity on the Hi and Mid. I use it on a master bus and on a separate channel. 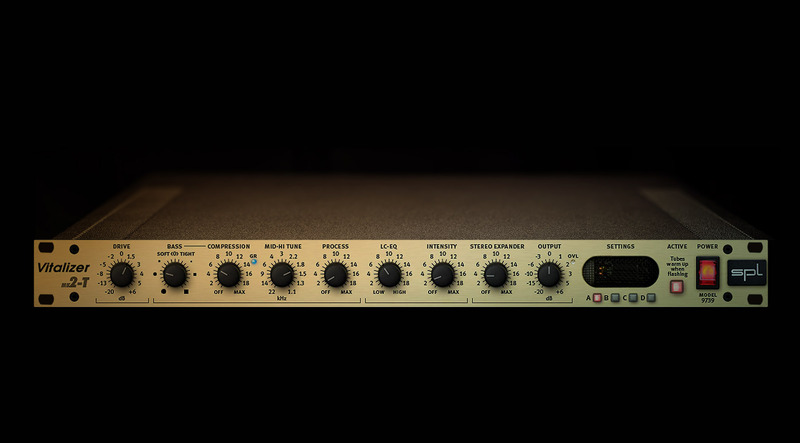 I have the hardware version of this plug in, so i was skeptical of how they could capture all the nuance of the Vitalizer, its a classic piece thats earned its place in many racks. Now that i can use it across multiple stems & bus masters, the Vitalizer has now become my favorite mixing tool and gets more use while mixing than ever before. Having ability to gently effect width & sonic shape without sounding like a "EQ" was just applied is the Vitalizers strength. Thanks UA for re-defining my purpose to this great piece of gear! around the sound usualy associated with heavy eq. This is the first plugin I've reviewed and it's a keeper. It takes a little time to work out the attributes, so be patient. I recommend it on a bus or on a master track. It is a plug in that could be easily overused, but a little patience and practice and I'm not sure I've had a mix that couldn't be improved with this plugin. Don't just criticize it because it didn't have presets. Make your own. Highly recommended. I have recently made a recording of a string orchestra in an acousticly very bad hall. The vitalizer has saved this recording. it's a must to have the Vitalizer on hand to get that extra edge, or depth on many tracks... specially with a Bass, Ac Guits, including the snare, or dull room drum ambience. Buss the BG vocals to it, and suddenly its magic!! Thanks UAD for giving us the SPL Vitalizer MK2-T Plugin! This plugin I was originally deciding to purchase the hardware due to loving it so much. It's really good on acoustical instruments and final mixes for that little tweak. I did quite extsensive research prior to my purchase, having listening to the excellence's of Katy Perry's 'Teenage Dream' album, this was used on the final mix for each track. It gives a whole new feeling to modern music and that colour saturation that almost makes it impossible to live without. Thanks again UAD! Amazing work! Sounds good. You can make The voice in front of a Track... I like???? Gran herramienta para masterización. No lo uso siempre, pero cuando lo necesito tiene un comportamiento impecable. For acustic guitars it is a blessing, for VO ... it is amazing, for percussion it is awesome (but not for all, like in the case of the timpani). Anything that has considerate amount upper frequencies that makes substantial part of the character of that sound will benefit from this plugin. It brings forward sounds differently than with an EQ. I definitely recommend it. It is one of those tools that you WANT to have in your arsenal for you will certainly use it, and abuse it. For mixing ... you MUST have it. I've been using this plug-in extensively for the past few days, and it's become one of my favorite new effects. I own a hardware Aural Exciter, and I thought that this would sound similar, but it's actually really different. It sounds more sheeny than excited in the high end, and I ended up preferring its sound in almost every comparison I did. It's easy to go overboard, however, and it's one of those plug-ins which pretty much requires a reliable monitoring setup to be truly useful. It adds a lot of clarity and presence to vocals and helps them sit upfront in a mix much easier than EQ often does, but I would recommend placing it after a compressor (I love the LA-2A) to get more predictable and even results. I used it on a choral recording, and I was really impressed with how much intelligibility it brought out in the words without sounding unnatural or overly-processed. It is good for emphasizing and balancing the low end of a mix, but I found it even more useful in this application by processing the isolated bass track directly. It's great on analog synths, and I ended up getting really good results out of extreme settings here. In fact, this was one of my favorite uses for this plug-in. It's interesting that such a digital effect could bring out so much rich, analog goodness. Very nice indeed! Another of my favorite uses for this was on acoustic guitar recordings. I was able to shift the tonal balance in a way that made it much more natural and clear, and I was able to do it much more quickly than with corrective EQ. On complete mixes I had varying results, but I almost always ended up preferring at least a little bit of this effect in the end. It can be used as a good corrective tool for some poor mixes, but it's much more effective at subtle mastering of an already good mix, which makes sense. Anyway, it's really a great plug-in, and I highly recommend it. The hardware unit is only about $1000, so that might be something to consider if you can afford it, but I will be quite content with this plug-in in the meantime. A good plug when used sparingly. If you need some frequency separation and clarity, this plug in works but there's a fine line before you're able to hear the process. I have good success using this plug in mastering muddy mixes. I've found that if you raise the output much above 0db, you really have to start working to lose the artificial, processed sound - but for quick fixes of muddy mixes, it works well. A well applied surgical eq like Massive Passive is a better bang for your buck but if you're looking for some new flavors, this is a pretty unique tool. Mam v studiu aj hardwarovu predlohu a tak som bol zvedavy ci bude tento plugin verny predlohe. Keby bol predavam hardware a mam o problem menej s routovanim a kablovanim. Plugin nie je zly, ale na basoch nerobi presne to co original, ani tak neprejasnuje nahravku ako original. Ja hardwarovy Vitalizer zatial nepredavam. Would be great if UA could write x64 versions so that their products at least can work as expected. This is a Corrective tool. It can be used to correct high end frequencies in particular in a similar but different way that the Transient Designer. I used it sparingly to correct my response and dynamics on my hi hat cymbals for my new break out single "Steppin Out". I still have a 'real' Vitalizer MK 2 Tube, and love it. I always said I wouldn't be parted with it for anything. But maybe the convenience of a plugin version might swing me?! I would love the opportunity to at least compare it to the real deal..